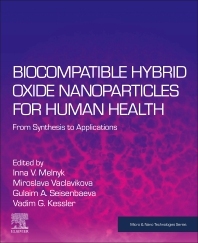 Biocompatible Hybrid Oxide Nanoparticles for Human Health: From Synthesis to Applications explores the synthesis, structure, properties and applications of functionalized oxide nanoparticles. The books shows the applications of materials depending on their composition and structure, with a focus on silicon, titanium and iron oxides, each of which was chosen because of their unique features, including silica because it is chemically resistant to most organic solvents, harmless to living organisms, can thicken flowable formulations, and increase the strength of materials, titania for its unique chemical, optical, electrophysical and bactericidal properties, and iron-containing materials because they possess important magnetic properties. Inna V. Melnyk is Senior Scientist at the Institute of Geotechnics SAS, Kosice, Slovak Republic and the Chuiko Institute of Surface Chemistry, NASU, Kyiv, Ukraine. Her research focuses in the areas of sol-gel technique, surface chemistry, directed synthesis and design of hybrid materials (magnetically controlled particles, silica particles, membranes) and their application in sorption processes, water purification, bionanotechnology. Miroslava Vaclavikova is principle Senior Scientist, Institute of Geotechnics SAS, Kosice, Slovak Republic. Her research focuses in environmental technologies, especially on development, testing and applications of novel materials based on iron oxides for the removal of heavy metals as well as on surface modification of minerals such as zeolites, clays, and carbon. Gulaim A. Seisenbaeva is Professor of Inorganic Chemistry at the Swedish University of Agricultural Sciences, Uppsala, Sweden. Her research focuses include the tailoring of functional hybrid adsorbents for water remediation and hydrometallurgy, and the application of porous oxides as alkali ion battery materials. Vadim G. Kessler is Professor of Inorganic Chemistry and Bionanotechnology, Swedish University of Agricultural Sciences, Uppsala, Sweden. His research interests include developing molecular precursor chemistry for the synthesis of nanomaterials, and developing nanotechnology for biomedical and agricultural applications.